WILBERFORCE, OH. - CSU Junior Daniel Lee has travelled half way around the world to research and test an idea that could prevent Harmful Algal Blooms (HABs), which are threatening the world’s potable water supply. Lee is testing remote sensing techniques in the Eastern Mediterranean Levantine basin by using Alunite stones to extract excess phosphorous from contaminated water to help prevent the growth of algal blooms. This semester he is studying abroad at the University of Nicosia. In Ohio, algal blooms, which present as blueish green algae, are often the result of excess phosphorus and nitrogen in water. Lee said he came up with the idea because a primary cause of the blooms in lakes is nutrient runoff after farmers apply fertilizers on their crops. Lee has been working with test farms, selected by the University of Nicosia, to place Alunite stones along the edges of planting fields to help filter soluble phosphorous. Central State’s International Center for Water Resources Management has been involved in research in Ohio to create a forecasting model to predict the arrival and toxicity of HABs on Lake Erie. The University was invited by the Ohio Board of Regents to work with three other colleges to examine Lake Erie’s harmful algal blooms (HAB) and lake water quality. Lee is the first CSU student to travel to Cyprus as part of a partnership between the University of Nicosia’s (UNIC) Environmental Engineering Department and CSU’s International Center for Water Resources Management (ICWRM). Dr. Krishna Kumar Nedunuri, Chairperson of the Department of Water Resources Management and Director of the ICWRM, said this study abroad program is the first step in future collaboration with the University of Nicosia in the areas of student and faculty exchanges in training, development, and research. Dr. Fahmi Abboushi, Director of CSU’s Center for Global Education, initiated the partnership by introducing UNIC to programs at ICWRM. Lee spent the spring and summer participating in various research opportunities. Last spring, he traveled to Kuala Lumpur, Malaysia for a training program on how to synthesize biofuels and other alternative fuels from food waste. Over the summer, he, along with CSU student Jasmine Walker, worked with The Ohio State University’s Summer Research Opportunities Program (SROP) where he worked in the STRIVE Labs, which stands for Stream River and Ecology Labs. There he also investigated the release of nutrients entering the water supply and causing algal blooms. He completed a six-week internship with the Northeastern Ohio Regional Sewer District and conducted tests to assess the effectiveness of microorganisms in wastewater treatment. 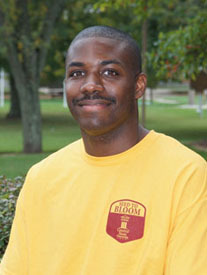 “Being at Central State has been a great experience. There definitely has been a lot of opportunities,” said Lee, of Los Angeles, Calif. “CSU has more opportunities per capita than most institutions because it is small. You are able to cultivate relationships with the dean. The director of the program is my academic advisor.